Early, G. (2018). Ali, Muhammad. In S. Bronner (Ed. ), Encyclopedia of American studies. [Online]. Johns Hopkins University Press. Available from: https://search.credoreference.com/content/topic/ali_muhammad_1942 [Accessed 25 April 2019]. Early, Gerald. "Ali, Muhammad." Encyclopedia of American Studies, edited by Simon Bronner, Johns Hopkins University Press, 1st edition, 2018. Credo Reference, https://search.credoreference.com/content/topic/ali_muhammad_1942. Accessed 25 Apr. 2019. 1942--2016, US boxer; first won title of world heavyweight champion in 1964. Born in 1942, Cassius Marcellus Clay, Jr. (named after both his father and the famous Kentucky abolitionist and politician), was one of the most gifted athletes of his time. In 1960 the handsome, gregarious boxer became a media star when he won a gold medal at the Rome Olympic games. Clay stunned the sports world in 1964 by beating heavily favored Sonny Liston to win the world heavyweight title, and he shocked America by announcing immediately after the fight that he had joined a militantly racialist, isolationist religious sect, the Nation of Islam, popularly known as the Black Muslims (seated ringside during the fight was the Nation of Islam's fiery orator Malcolm X). Shortly afterward the young fighter announced that he was changing his name to Muhammad Ali. The press and the white public roared disapproval, saying that Ali had joined a hate group, that the Black Muslims would take all of his money, that he should be stripped of his title, that he was not a loyal American, nor was he an appreciative black. His notoriety was such that, at one point in the mid-1960s, he had a series of title defenses outside the United States, in Canada (George Chuvalo), in London (Brian London and Henry Cooper), and in Germany (Karl Mildenberger). Ali was a national hero in the cold-war era, despite the fact that he was a black who, having grown up in Kentucky, lived under an entrenched system of racial segregation. Ali may or may not have been a particularly complex man, but he is a complex symbol. The fame of the brash young prizefighter from Louisville certainly eclipsed that of nearly every other major African American athlete including Jesse Owens, Joe Louis, Wilma Rudolph, Wilt Chamberlain, Jim Brown, Bill Russell, and Jackie Robinson. Certainly, he is remembered as the heavyweight boxer who generated the most drama both in and out of the ring. Opposed to the draft, Ali refused to serve in the Vietnam War. He was convicted of violating the Selective Service Act in 1967 and stripped of his titles. He was also banned from boxing anywhere, since his boxing license was universally revoked. Far from diminishing his stature, Ali's stance against the war and his willingness to go to prison garnered him a new level of respect among many of the white press who had formerly castigated him. He also became a darling of the white Left, although he shared virtually no other political views with them. Ali appealed his conviction, and it was overturned by the Supreme Court on a technicality. On one hand, Ali's political views as a member of the Nation of Islam would have been viewed by a leftist, black or white, as parochial, even reactionary. On the other hand, to nationalist blacks he was a Third World hero, a Pan-Africanist hero, because he was, clearly, the most famous Muslim in the world and the most publicized athlete to speak out about the nature of race relations in the United States. Returning to boxing in 1970 after a three-and-a-half-year layoff, Ali lost his heavyweight title to Joe Frazier in 1971 in one of the biggest boxing matches in history. He eventually reclaimed his title by beating George Foreman in Zaire in October 1974, a victory that was rejoiced throughout the United States, even among many whites, who thought that Ali had been treated unfairly and deserved to win the title back. Ali continued to box throughout the 1970s (far past his prime as an athlete) largely because he was earning huge sums to do so. He retired from the ring in 1981 with a record of fifty-six victories and five losses. Following Ali's remarkable appearance at the torch-lighting ceremony that opened the 1996 Summer Olympic Games in Atlanta, some blacks commented that Ali is loved by whites now only because of his Parkinson's-like illness, which has left him unable to speak. For these commentators, the elevation of Ali's status to hero, no doubt bolstered by the 1996 Academy Award–winning documentary about him, When We Were Kings, is in direct ratio to his having become a harmless, even a maimed presence, the beat-up, has-been fighter walking on his heels. There is some justification to this view but it simplifies greatly the complex levels at which Ali operates as an athletic, political, racial, and national icon, sometimes in stages and sometimes simultaneously. Ali remains a hero for many today because he seems (more than any other figure from that era) to embody the virtues of the antiestablishment, civil rights era, revolutionary 1960s and the success-oriented, narcissistic hedonism of the 1970s. 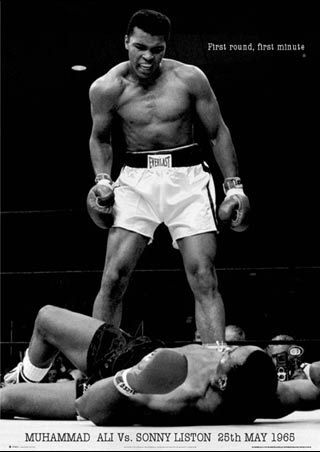 Muhammad Ali vs. Sonny Liston. 1965. Princeton University. Early, Gerald, ed., The Muhammad Ali Reader (Ecco Press 1998). Edmonds, Anthony O., Muhammad Ali: A Biography (Greenwood Press 2005). Gorn, Elliot, ed., Muhammad Ali: The People's Champ (Univ. of Ill. Press 1995). Hauser, Thomas, Muhammad Ali: His Life and Times (Simon & Schuster 1991). Hauser, Thomas, The Lost Legacy of Muhammad Ali (Sportclassic Bks. 2005). Kidd, Stuart, Muhammad Ali, Southerner, in Transnational America: Contours of Modern US Culture, ed. by Russell Duncan; Clara Juncker (Museum Tusculanum 2004), 189-214. Lemert, Charles, Muhammad Ali: Trickster in the Culture of Irony (Polity 2003). Remnick, David, King of the World: Muhammad Ali and the Rise of an American Hero (Random House 1998). Sammons, Jeffrey, Beyond the Ring: The Role of Boxing in American Society (Univ. of Ill. Press 1988). Torres, Jose; Bert Randolph Sugar, Sting Like a Bee: The Muhammad Ali Story (McGraw-Hill 2001). Williams, Shawn, I'm a Bad Man: African American Vernacular Culture and the Making of Muhammad Ali (Lulu.com 2007). The civil rights movement was a struggle to fulfill the promise, made in the Thirteenth, Fourteenth, and Fifteenth Amendments to the U.S.